Raiderforums • Patrick Mahomes Calling Wrong Plays In Practice,,,, 7 Ints ?? Patrick Mahomes Calling Wrong Plays In Practice,,,, 7 Ints ?? The Chiefs decided to go all-in on Patrick Mahomes earlier this offseason, trading Alex Smith to the Redskins in favor of the youngster. 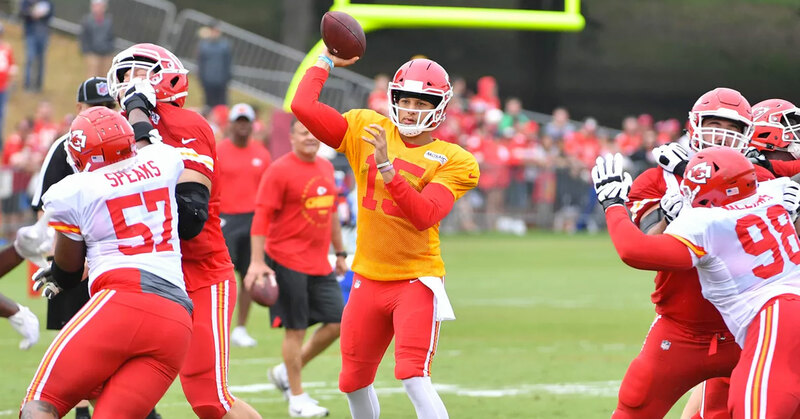 Early play of training camp is worrying fans though, with Mahomes tossing seven interceptions in six practices, including 3 in a 15 minute span. “He had a few hiccups today,” Chiefs offensive coordinator Eric Bieniemy said referring to the three he tossed on Wednesday. Head coach Andy Reid came to Mahome’s defense though, saying “I want him to test the offense. If you don’t have the intestinal fortitude you’ll end up being one of those QBs that checks it down all the time,” in what sounds like a clear shot at Alex Smith. If Mahomes’ mistakes don’t get hashed out during the preseason and continue into the regular season, the Chiefs could miss losing in the first round of the playoffs this year. Air Raid QBs fail to fly in the NFL. A former RB is their OC?? ?How long has he been an OC? Chiefs Planet is going to melt down this year, well... more so then usual and it will be glorious to watch. Alex Smith is an underrated qb and the Chiefs will miss him. Willmark wrote Sun Aug 05, 2018 2:42 pm: Chiefs Planet is going to melt down this year, well... more so then usual and it will be glorious to watch. They already have their excuses ready for Mahomes. Essentially the lad is still a rookie....and fully expect him to play like one this year. I do think he has a strong arm...but it takes time to learn how to win games in the NFL. Smith - while not dynamic - knew how to win games. Think the Chiefs are going to suffer where it matters most - in the loss column. Looking forward to the Raiders DL giving the young lad a bloody nose - and sending him home weeping. I am warning you, Rainman.